I say goodbye to Doris at the front door and Fritz at the train station. Three hours later I am back in Airolo following a trail along the south-facing slope of the valley. My pack feels heavy, my legs sluggish, but it’s always hard going back after so many days off. Gotthard Pass hangs behind me in the valley. I keep glancing back at the white snow glowing in the sunlight, never quite believing it is all behind me now, the monster gone. I stop at a little chapel near twilight. Lukas, a friend of a friend, is staying in a cabin nearby. Part of me doesn’t want to stop. I’ve been idle too long and need to find some momentum again before stopping for New Year’s, but Lukas hiked the PCT in 2012 and the timing of it all seems too perfect to miss for a few extra miles. The cabin glows with life and I forget ever thinking of passing by. There are 13 of us there, if I count right, hanging out in the main room, five kids, music, singing, laughing, a warm pot of food, a fire burning in the stove. Outside the night sky is all stars and the shadow of mountains on the horizon. Inside it is all warmth. Before I leave in the morning, Lukas and I sit on the rock wall outside the front door, slicing open chestnuts to roast and watching the sun spill light on the far peaks. He tells me about his first day on the PCT, heading south across the snowfields in Washington, slipping on a slope, and sliding to his death until a tree stopped him. He still has the scars from leaving the skin off both forearms spread across hundreds of feet of icy snow as he tried to stop himself with an ice axe. But he didn’t quit. He kept walking to the end. We slice the last chestnuts and return to the fire in the cabin. He roasts them over the flames until the shells blacken and the meat is warm then we all sit around the table, cracking them open and stacking the shells into piles. It’s hard to say goodbye, but the trail always calls again. I walk away, noticing chestnuts among the fallen leaves for the first time. Posted in Europe North to SouthTagged backpacking, ENS, Europe North to South, featured, hiking, PCT, thru-hikingBookmark the permalink. The Lucas PCT freefall must be one fantastic story. Thanks Lucas family. Grateful the tree stopped Lukas slide and he is still here! 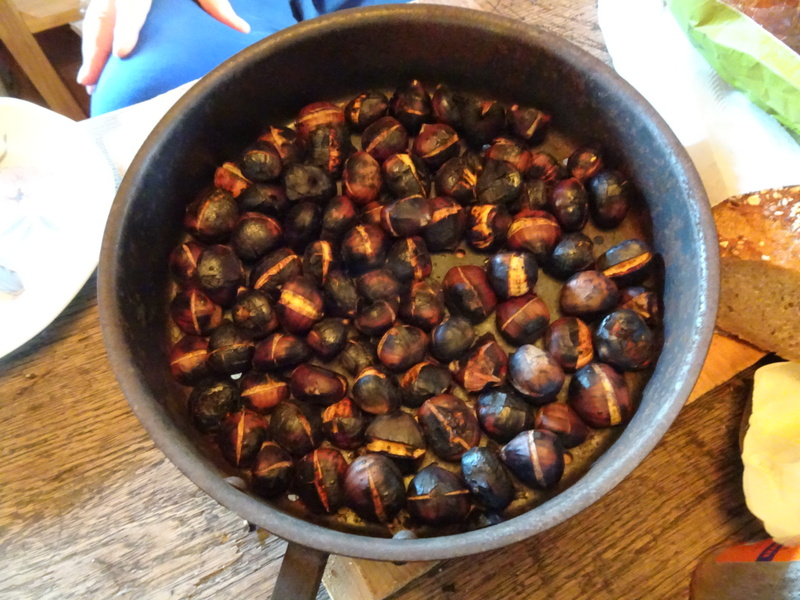 Thanks for the picture of chestnuts on an open fire – I’ve never seen that! Great story about Lucas and his gumption after such a fall! “I walk away, noticing chestnuts among the fallen leaves for the first time.” –Simple and eloquent.